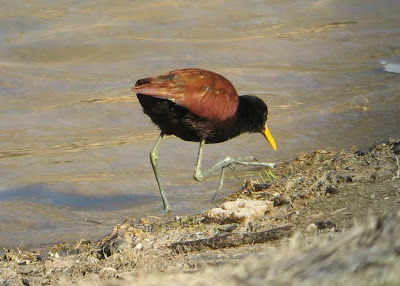 Long staying Northern Jacana - Dave White Municipal Golf Course in Casa Grande, Pinal County, AZ. 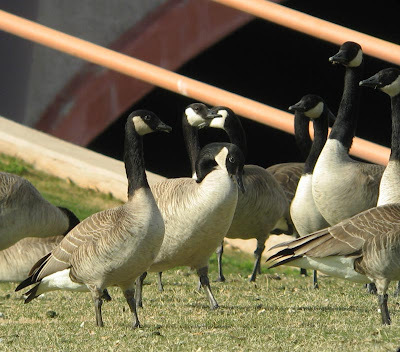 Cackling and Canada Goose selection, Scottsdale - Feb 1st and 2nd. 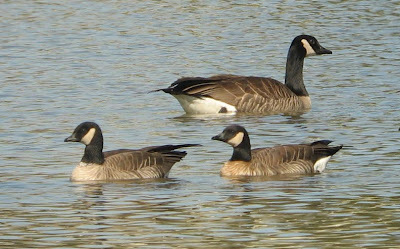 Recent visits to the McCormick Ranch Lakes in Scottsdale have produced a most interesting and diverse range of both Canada and Cackling Geese. 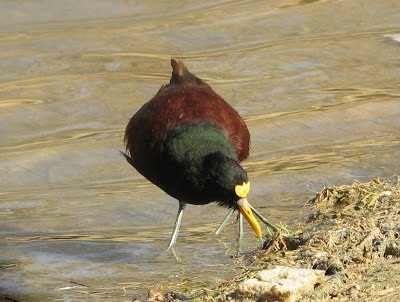 The birds are often close allowing for great looks and subsequently for reasonable images to be taken. Most of my visits here have been alone but on Saturday afternoon I spent an enjoyable four hours with Pierre Deviche and Eyal Shochat trying to get to grips with some fine identifications challenges. 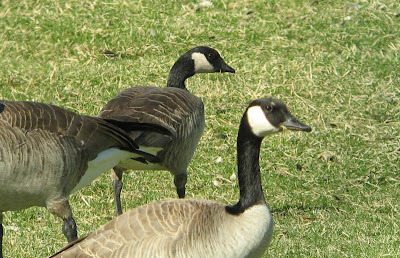 In essence we identified at least seven Cackling Geese on February 1st and 2nd, including 1 Richardson's, 2 plus Taverner's and 4 birds that closely associated together but have thus far eluded a sub-specific identification. Here's an image selection from just a handful of the birds encountered. I'm extremely grateful to Steve Mlodinow for his instructive comments on the identification on some of these birds. Naturally, all identifications are tentative and I'm open to constructive comments on any of these birds. 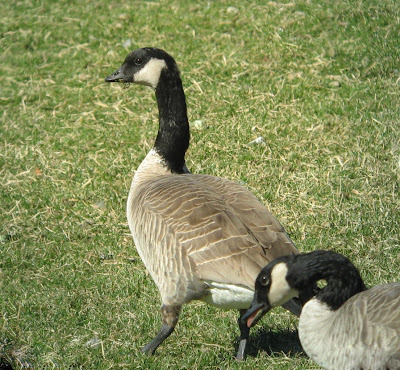 'Giant' Canada Goose B.c. maxima (right) with B.c. moffitti. Large, impressive, with extensive broad white cheek extending all the way to lower mandible. Variable whitish markings across forehead, and this case, above the eye. Compare the head and bill profile with the moffitti, and the amount of visible white about the head. Feb 2nd, 2008. 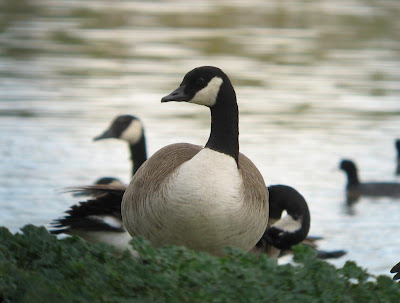 Lesser Canada Goose B.c. parvipes. The most frequent small white cheeked goose at McCormick Ranch. January 28th, 2008. 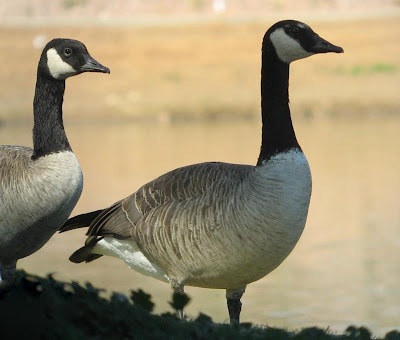 Lesser Canada Goose B.c. 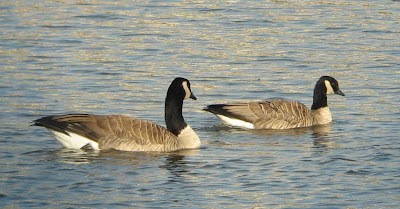 parvipes (right) and Cackling Goose B.hutchinsii (left). Interesting comparison of head and bill profiles, and overall size. The sub-specific identification of this Cackling Goose is (currently) uncertain but it could be Richardson's Cackling Goose (B.h. hutchinsii) February 1st, 2008. Cackling Geese B.hutchinsii. All four birds at the front of this group are Cacklers, as yet unidentified to form. Feb 2nd, 2008. Cackling Geese B.hutchinsii. Two birds from the tight group of four above - form uncertain. Feb 2nd, 2008. 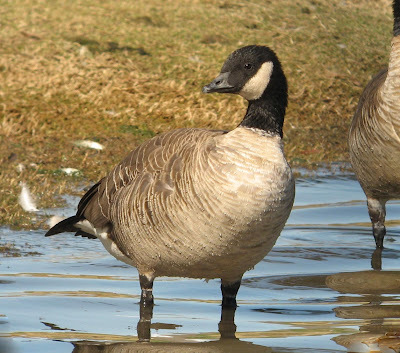 Cackling Goose B.hutchinsii. The smallest and darkest of the Cacklers present at McCormick Ranch - form uncertain. Feb 1st, 2008. 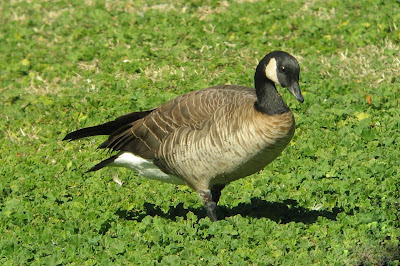 Cackling Goose B.hutchinsii. One of the group of four small Cacklers - form uncertain. Feb 1st, 2008. Taverner's Cackling Goose B.hutchinsii taverneri (at rear). Very similar to parvipes but shows shorter, more triangular shaped bill blending neatly into gently sloping forehead. Taverner's Cackling Goose B.hutchinsii taverneri (left most bird) with B.c. moffitti and at least one Lesser Canada Goose B.c. parvipes (the first bird to the right of the Taverner's with neck fully extended and head raised). Taverner's Cackling Goose B.hutchinsii taverneri. Similar to B.c. 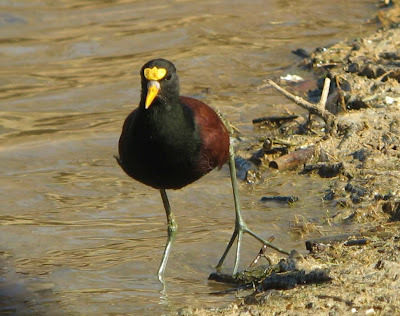 parvipes, but shorter, more triangular shaped bill, duller cheek and chest. Richardson's Cackling Goose B.hutchinsii hutchinsii (rear) with B.c. moffitti. Overall color cast quite similar to B.c. moffitti, but obviously small with a Cackling Goose-type bill and rather square, 'blocky' head shape. 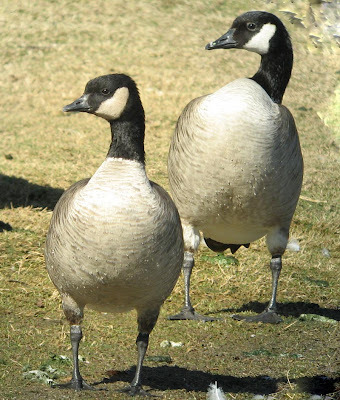 Richardson's Cackling Goose B.hutchinsii hutchinsii (right) with B.c. moffitti. 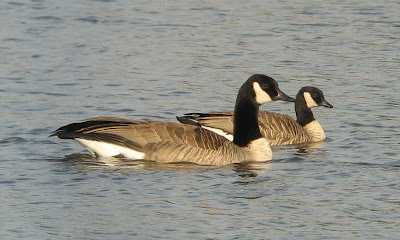 Richardson's Cackling Goose B.hutchinsii hutchinsii (left) with B.c. moffitti. Very small with 'Cackling Goose-type' bill, rather blocky head shape, and steep forehead. Quite notable broad 'frosty' fringes to upperparts compared to moffitti.